For Rodolfo (Humberto de Vargas), life at home feels empty and cold, as if he doesn’t belong there. Meanwhile, his first wife Graciela (Sara Bessio) and their teenage daughter, Ana (Anaclara Ferreyra Palfy), are going through defining moments in their lives. Subtly, Rodolfo will try to slip back into the place he once had next to them and walked away from ten years ago. 3 is a comedy about three people condemned to the same, absurd fate: being a family. Pablo Stoll Ward was born in 1974 in Montevideo, Uruguay. Together with Juan Pablo Rebella he scripted and directed 25 WATTS (2001) and WHISKY (2004). He is a founding partner at Control Z Films, the production company for his own films and others, including LA PERRERA (2006), ACNÉ (2008) and GIGANTE (2009). 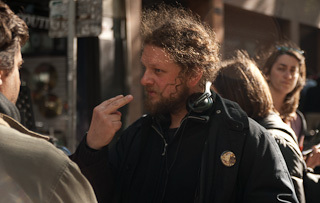 In 2009 he directed HIROSHIMA, his first solo feature film, which was chosen for Toronto, Rotterdam, Jeonju, Mar del Plata and Jerusalem, among other international film festivals.